Anyone know if a V2 slide and barrel fit and function on a SA frame ? I picked up a V2 parts kit for some spare parts for my SA,that is why I am asking. Re: Compatibility on a Canik? I'm not sure about an SA frame, as I don't have an SA or SF anymore. But, other than the Elite, all the frames are pretty much the same. I took my DA slide and put it on my SFx frame. No issues dry firing. Of course, the decocker doesn't do anything, and it's single action only. But it does appear it would function. That's my uneducated guess though, as I have not live fired it, and do not know what consequences could occur. I do know that the SFx and DA do both Function when swapped. I have not tried with live ammo. Nice color combinations. I'm now thinking of having the slide of my SFx cerakoted black. Thanks guys ,that is pretty much what I thought. 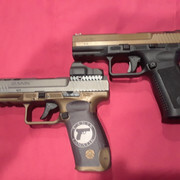 I wanted to ask ,I picked up the parts on gunbroker not knowing what version of Canik it was,but for the price , I thought it would be good to have as some if not all of the parts would fit the SA or the Sf elite I have. If you do take it to the range, let us know how it goes. I've always been curious how it would function. Fired the V2 this afternoon on the SA frame and it functioned fine for several mags. I did have a magazine issue due to a weak spring in a Canik mag I purchased from a pawnshop. I did notice a huge difference in POI USING 124 gr PPU and ZQI versus 115gr Winchester white box. 124 was dead on and the WW115 was all over the place. Just wanted to post an update that it does work! Good info, thanks. I tend to stick to 124gr in my Caniks, and all guns in general, as I find it to be more accurate for me. Did the trigger pull feel the same, as it would with the SA slide on it? No the trigger pull felt lighter on the V2. It had more wear than my SA ,which almost new. The V2 racked the slide smoother and just felt better than my SA did on the same frame.